Word Around the Net: REGULATORS RIDE! The problem is, they were just words. President Obama then turned and did exactly what he reassured these people he would - and could - not do. He ordered ICE to not deport illegals unless they are heinous criminals or serious troublemakers. Not that they were doing much of it to begin with, but this is exactly what he said he'd not do: bypass the law to implement his own ideas. The EPA classified milk as oil, which requires dairies to build special containment facilities and have special environmental hazard cleanup equipment on hand, costing hundreds of thousands of dollars. Milk technically contains some oils, and that was good enough for EPA head Lisa Jackson. Push for the Food Safety Enhancement Act which passed, requiring farmers to grow crops in "sterile areas, surrounded by 450 foot buffers, so that they are not exposed to other vegetation, runoff water, birds, beasts, or wildlife of any kind." Require all farms to create and implement "food safety plans" which are subject to warrantless searches at any time by the EPA under the same act. The new rule has been in development for several years but the first phase of compliance hits utilities in 2012. WPS [energy provider Wisconsin Public Service Corp.] said it won’t have time to install pollution controls by next year at its plants, but will be able to comply by purchasing credits from other utilities that have cut emissions. In other words: you buy carbon credits to make up for your emissions over a certain level which is exactly what cap and trade consists of. All in all, regulating agencies have seen their budgets grow by 16% under President Obama, so far. 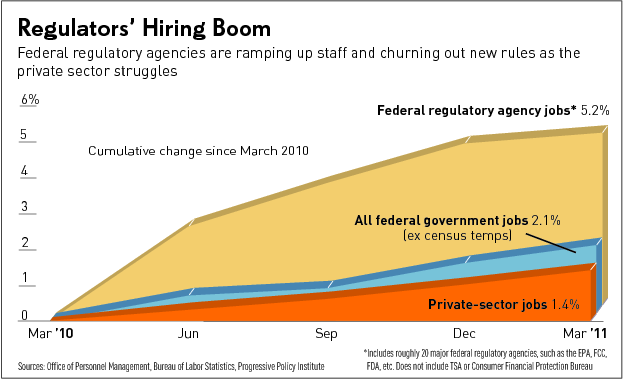 regulators have hired more than 3% more workers than the rest of the federal government, already the fastest-growing sector in the economy. And much more is on the way. The Federal Register notes that more than 4,200 regulations are in the pipeline. That doesn't count impending clean air rules from the EPA, new derivative rules, or the FCC's net neutrality rule. Nor does that include recently announced fuel economy mandates or eventual ObamaCare and Dodd-Frank regulations. Supposedly when Barack Obama filled in for a real professor in constitutional law classes, he'd skip the parts about separation of powers. Apparently he found them annoying and in the way of real change and a fundamental transformation of America. In such a world, there is no “law” — in a sense of (a) you the citizen being found by (b) a jury of your peers to be in breach of (c) a statute passed by (d) your elected representatives. Instead, unknown, unnamed, unelected, unaccountable bureaucrats determine transgressions, prosecute infractions, and levy fines for behavioral rules they themselves craft and which, thanks to the ever more tangled spaghetti of preferences, subsidies, entitlements, and incentives, apply to different citizens unequally. President Obama has already been held in contempt of court by a federal judge for blatantly violating the constitution and imposing his own will through the executive branch agencies. The law? Who cares. Separation of Powers? Whatever. Constitution? Well it was wrong anyway. President Obama has a higher calling, a greater source of power - himself. I apologize for hammering this nail again, but this is something that needs to be repeated across the nation as often and insistently as possible until the next election when we can do something about it. If we don't, well I do not suppose there's much future for the nation as we know it. And people wonder what the Tea Party Movement is so upset about. Tossing in some irony here: the groups that the President is trying to cater to are still unhappy, because his actions only apply to the 300,000 illegals that are in the deportation process.